Wakakozake features a 26-year old woman named Wakako. She works in an office and sometimes has a long day. And when you have a long day, you want to eat something that makes you feel good. Wakako really likes food. 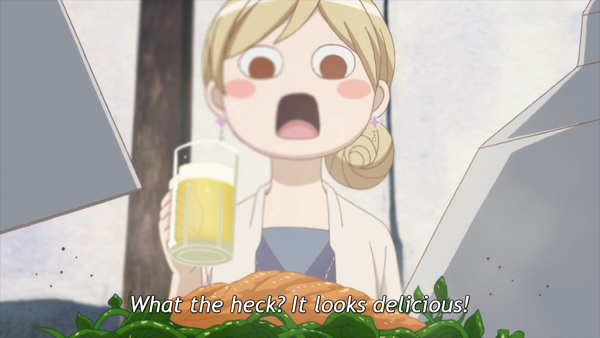 Every episode features Wakako walking into a different bar or restaurant and trying out a new dish. She’ll explain the cooking process of the dish and how and why the flavors work together. She’ll even tell you what drink goes well with the meal! Each episode is only 2 minutes long. Visually, the show looks quite nice. All the dishes look visually appealing and the restaurants appear well detailed. I especially like Wakako’s appearance. It’s very non-traditional and allows her to stand out compared to other shows. Not to mention the facial expressions she pulls can be quite amusing to watch. Outside of the show’s catchy opening theme, there’s no real music to talk about. Instead, the focus is on the sound effects and Wakako’s narration, which is quite nice to listen to. 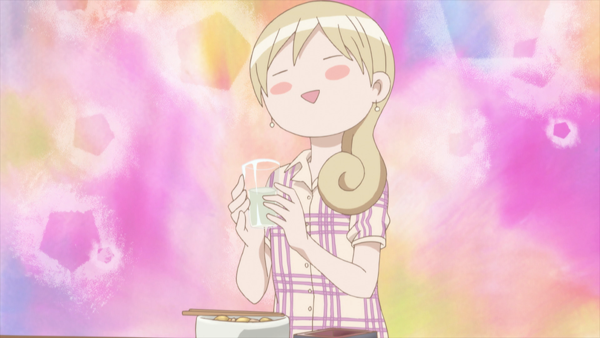 I do believe Wakako is enjoying the food she eats. Like I said, Wakakozake is only 2 minutes long. So there is no story to talk about. Occasionally, she’ll talk about her day but in the end, it’s completely inconsequential. While it sounds like there’s not a lot happening with the show, it’s actually really engaging to watch. The show makes the dishes look really appealing and the information about the meals is quite nice. It’s a nice show to lay back and watch during your lunch break. Not every show needs to be high stakes. Much like why people like cooking shows, Wakakozake, makes food appealing. And that’s really all there is to the show. I personally thoroughly enjoyed the show and found it as a really nice cool down show. It’s relaxing and fun and presents food in an appealing manner. I personally recommend this show to anyone who enjoys food or food/travel shows. That said, I recently learned that there is also a live action version of Wakakozake. Hey Crunchyroll, could you license that show also? I would love more of this. It all looks quite delicious. 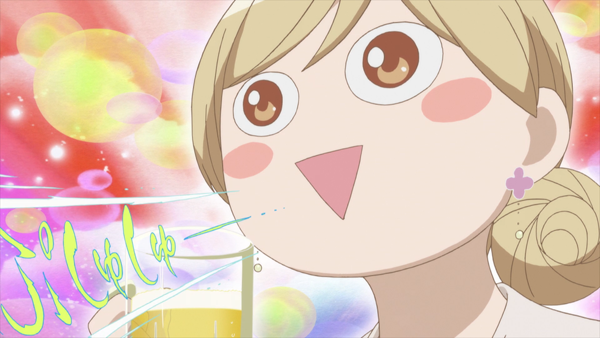 If you’re interested in watching Wakakozake, you can officially watch the show on Crunchyroll.